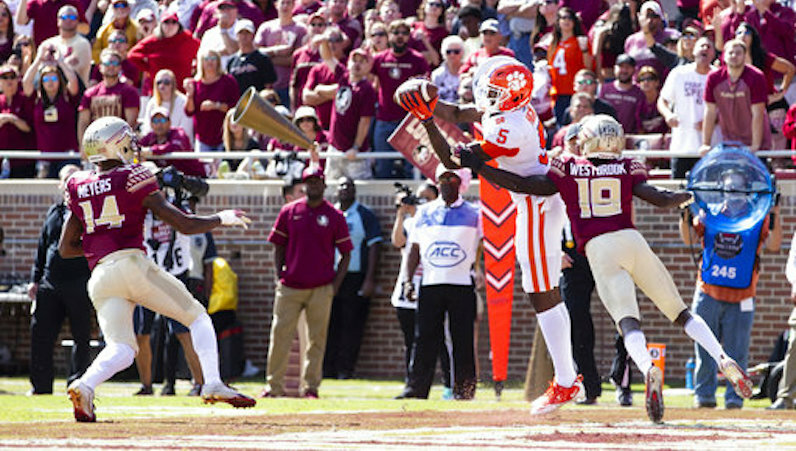 What started out as a football season with strong top-to-bottom expectations in the ACC, continues to wallow in a series of missed opportunities. Four ACC teams landed in this week’s AP Top 25 Poll — with three squads clustered at the bottom of the poll (22-24). Clemson is a juggernaut, which is good for the ACC; the league needs this team to continue carrying water. In the Coastal, though, it’s total chaos. Agreed. And now, on to the rankings. Clemson just keeps gaining more and more force each week as it ramps up for what seems like another inevitable collision with Alabama. The Tigers curb-stomped FSU in one of the worst defeats in program history; in that performance, quarterback Trevor Lawrence continued to shine. The freshman has now completed 65 percent of his passes (8.4 yards per attempt) for 16 touchdowns and two interceptions. There’s nothing quite like a Saturday shootout in the dome, especially now that Syracuse is ranked inside the AP Poll for the first time since 2001. NC State and Syracuse combined for over 1,110 yards of total offense and 92 points, which is sorta insane. But, hey, let’s still go ahead and highlight a defender: Andre Cisco, who continues to be awesome. With two minutes to play against Syracuse, down three (44-41), Ryan Finley was picked off by Andrew Armstrong; it was the game’s lone turnover and *Reductive Analysis Alert* the difference in the game. In a game with a ton of possessions, this proved costly. Finley and Kelvin Harmon (11 receptions, 247 yards, two touchdowns) were, again, excellent, but NC State had zero answers for Eric Dungey and the Orange. According to Sports Reference, this was the first time since 2012 that NC State has allowed over 400 yards passing and three touchdowns through the air. In the win over Miami, star running back AJ Dillon returned to the lineup and ran over an excellent defense: 32 carries for 149 yards and 14-yard touchdown run. Going for over 430 yards of total offense is impressive, too; this is a really good team. The defense in Charlottesville is the backbone of the now nationally-ranked Virginia Cavaliers; however, Bryce Perkins continues to be a serious difference-maker for Bronco Mendenhall. In the win over UNC, Perkins became just the 10th ACC quarterback — going back to the 2000 season— to throw for 200 yards and three touchdowns, and run for 100 yards and a touchdown, too. The Malik Rosier Experience continued to underwhelm against a good BC defense — two interceptions, 4.2 yards per attempt — but Mark Richt is sticking with the veteran at quarterback. Can the Hurricanes regain form against the Blue Devils? The Panthers continue to ascend up the ACC Football Power Rankings. Since October, Pitt has turned things around: a win over Syracuse, a near upset at Notre Dame and now a win over Duke. Pitt ran for 484 yards and four touchdowns against Joe Giles-Harris and the Blue Devils. That’s the only time a non-Georgia Tech ACC team has run for over 480 yards in a game. The 634 total yards Duke allowed in defeat against Pittsburgh — the sixth most the program has allowed since David Cutcliffe arrived. Now Duke hits the road to face Miami; the Hurricanes have won four straight in the series. Going back to the 2000 season, only six times has an FBS team thrown two or fewer passes in a game and scored at least 45 points; Georgia Tech has now done this twice in the same season. TaQuon Marshall is expected to be back under center against UNC, too. After facing an endless supply of downhill running packages in Georgia Tech, the Hokies now have to work to stop Boston College’s AJ Dillon, who leads the ACC with 133.5 rushing yards per game. Bud Foster better have these dudes ready. After trending in the right direction for a few weeks, FSU got exactly what the doctor didn’t order: the war machine that is Clemson coming to town. After that performance — one of the worst defeats in program history — Willie Taggart questioned his team in pretty serious fashion. FSU has gone to a bowl game in 36 straight seasons; however, that could be in serious jeopardy, again. Florida State, at 4-4, has four more games on its schedule — three of which come against ranked teams, and NC State. Wake Forest snapped a two-game conference losing slide with a 21-point road win at Louisville. Our one super serious takeaway: Greg Dortch may be a magician. For the third straight week, UNC fought really hard but fell on the road — this time to a solid UVA team. Back in Chapel Hill for just the third home game this season, North Carolina’s run defense, which ranks 12th in the ACC, has to face a Yellow Jackets squad that loves nothing more than to almost exclusively run the football. Clemson now a 38 pt favorite over Louisville. Largest point spread in an ACC game since 2002 when FSU was a 45 point favorite over Duke.